The squirrels running around in your yard are generally harmless creatures, but once inside your home, they can cause a significant amount of damage. Squirrels are opportunists who gnaw through loose roofing or foundations and crawl through existing gaps such as chimneys and pipes in search of food, shelter, and safety. Squirrels that gain access into areas such as your attic no longer have to worry about predators, allowing them to feel safe, especially when looking for a comfortable place to birth their young. During the day, they will go outdoors to your yard to forage food from bird feeders, pet dishes, gardens, or the ground beneath trees. The longer that squirrels live inside the home, the more of a possibility for an infestation to occur. This is problematic because squirrels, like other rodents, have continuously growing incisors which they need to keep filed down, causing them to chew on various materials such as wood beams, plastic piping, electrical wiring, vents, and siding. And while the amount of noise squirrels create is irritating, it’s the thing you should be least worried about. Their chewing and nesting habits are what causes the most destruction, resulting in unsanitary conditions, costly repairs, and potential floods and fires. 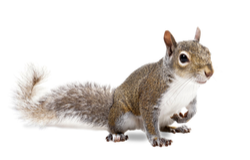 If you have a squirrel infestation, don’t wait to call an experienced technician at Critter Control® of Orlando to come and resolve the problem. We will remove all of the squirrels, including any babies, and then put preventative measures in place to ensure no future animals can inside. We can even replace your soiled or torn insulation and clean up any messes left behind. For more information regarding our squirrel removal services, please call us today at 407-295-7194.